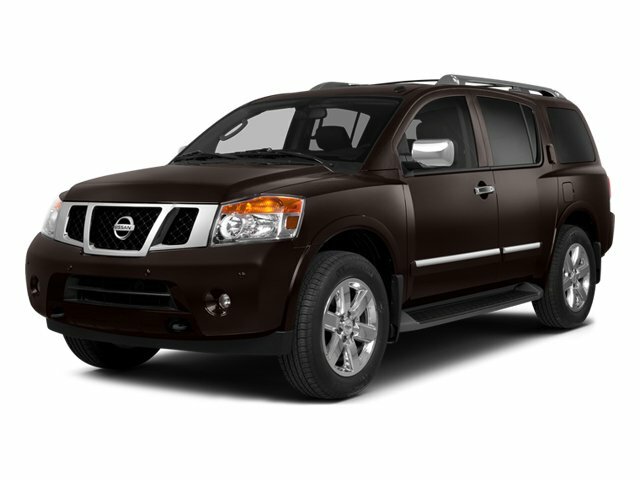 RESERVE PKG w/ 20 DARK CHROME WHEELS - NAVIGATION - 4WD - HEATED LEATHER - WHITE PEARL 2014 NISSAN ARMADA - It is nicely equipped with features such as Platinum Reserve Package (Body-Colored Exterior Door Handles, Center Console w/Cupholder Lid, Chocolate Embroidered Floor Mats, Chocolate Leather Steering Wheel, Dark Chrome Body-Side Molding Insert, Dark Chrome Outside Mirrors, Dark Chrome Roof Rack Ends, and Reserve Exterior Tailgate Badge), ** POWER DRIVER SEAT**, **LEATHER**, **MOONROOF/SUNROOF**, **NAVIGATION/GPS**, 20 Dark Chrome Wheels, 3rd row seats: split-bench, 4WD, ABS brakes, AM/FM radio: SiriusXM, CD player, Dual DVD Head Restraint Monitors, Entertainment system, Front dual zone A/C, Front fog lights, Fully automatic headlights, Heated Front Bucket Seats, Illuminated entry, Leather-Appointed Seat Trim, MP3 decoder, Navigation System, Panic alarm, Power door mirrors, Power driver seat, Power moonroof, Power passenger seat, Power steering, Power windows, Rear air conditioning, Rear window defroster, Rear window wiper, Remote keyless entry, Roof rack, Tilt steering wheel, Traction control, and Trip computer. Have one less thing on your mind with this trouble-free Armada. For additional information about this vehicle or to schedule a TEST DRIVE please contact us at 866-536-3768.